With the Wilderness Trails Skills course EcoTraining wants to give back to the industry and conservation, introduce guides to one another and share what they have. 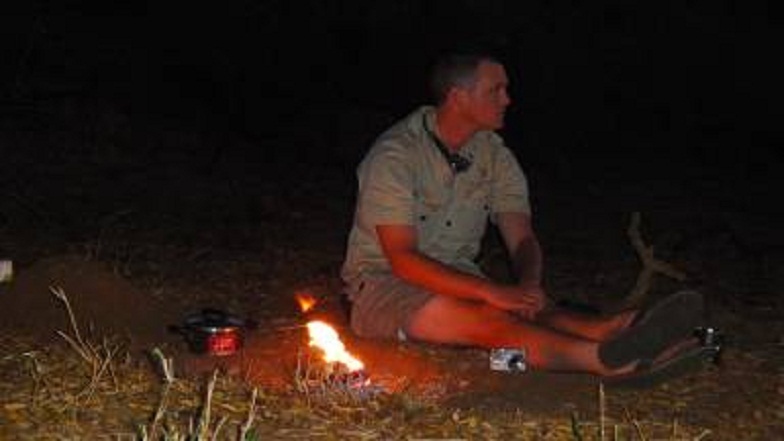 The 5 nights/6 days course will be spend exploring one of South Africa last true wilderness areas on foot. The Makuleke is a 24 000 hectare concession of pristine wilderness inside the Kruger National Park. Bruce Lawson, one of South Africa’s premier wilderness guides and one of only a hand full of guides who have passed the SKS DG and Birding qualifications, will be tutoring each course. Lessons you will be taught will not be found in any books, but will rather be hands on learning. For more information/bookings for the Wilderness Trails course, visit www.ecotraining.co.za or send an email to enquiries@ecotraining.co.za. There’s still some spaces left on the courses below in the next couple of months. Experience things and gather knowledge that will blow you away. From a handful of days to one year, the choices are endless! Office: The dedicated team at head office in Nelspruit is ready to answer all your questions and queries. Don’t hesitate to contact them! Selati: The bush and its inhabitants never cease to amaze, surprise and excite. And no two days are ever the same! “So many things happened in those first couple of weeks, even the first days were just amazing and such a lot occurred, where do I start??? I thought I had just seen about everything in those first couple of weeks. Boy was I wrong! The Selati River has been dry since the floods last year and hadn’t see water in a while. Then we had rain for two days straight, nothing serious, more like a light drizzle. We were still jogging up and down the river bed getting some exercise. I went in to take a shower and ten minutes later walked out to hear water running in the back ground. I did not know what was going on. I walked to the river bed to see water flowing down in a gush! Some students were standing on the rocks, just watching in awe! This was by far the most amazing natural phenomenon I ever witnessed! I could not believe it. We were all excited. The next day we got flood warnings and were told we need to rotate in the middle of the night to keep watch on the water levels as most of our tents were very close to the river bed. It was exciting at first until everything was wet: our clothes, our shoes, our beds. We had to eventually get ready for evacuation so we all packed our things and took it higher up. After standing guard for three nights, checking the water levels, the river started going down and there was no need to evacuate. 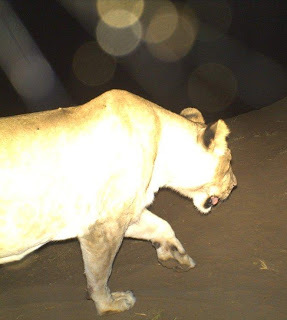 Makuleke (Kruger National Park): When she first set foot on African soil way back in 1997, Salka B Eynon just felt it in her heart and has since returned many times to this magical continent that kept pulling at the strings. And then, to mark a very special birthday, Salka’s daughters gave her the best gift in the world – spending a month in the bush learning about the environment and getting to walk amongst all things wild and wonderful! The setting – EcoTraining’s wilderness camp in the Makuleke concession in the far north of the Kruger National Park. “I must say I was weary about sharing a tent with a stranger and also about the mixture of people I was about to meet. And it all turned out so well – much due to the organization and the way the whole setup was done. And that is a challenge – to address people who have lived more than half their lives as well as the ones that hardly started. “The feeling of tranquility just walking in silence when the world is awakening around you – the special feeling of being cared for in terms of security, so that you can focus on the small things around you. 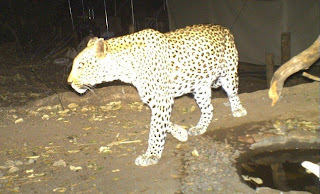 The special feeling when the group was divided into two when we were walking closer to the two leopards on foot. The guides’ situational awareness and care for every angle. “A picture that I am so sad I didn’t capture with my camera is when we came really close to a heard of buffaloes. Our guide was just in front, quietly in the grass, the sun from behind shining on the dust – so beautiful. Writing this I realize the picture is very alive inside of me – even without the camera. “One morning we took our break in the Limpopo riverbed. The good thing about spending a month together is that there is time for our different personalities to mix. In Sweden we make angels in the snow. I loved doing it in the sand, the moment after we saw some warthogs crossing from one country to another, with the little ones beside. It’s easy to feel privileged. “So many times I had to pinch myself for believing I was there. Instead of sitting in my office or going to meetings dressed in a suit, I was sitting on top of a game viewing vehicle with the wind blowing through my hair looking for big cats (the spotted ones…). 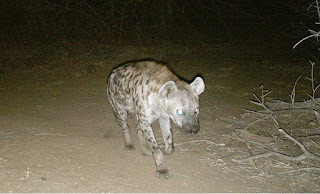 Mashatu (Botswana): Ever wonders what happens when no one is watching, especially in nature? Here's your chance... We have various camera traps in and around our wilderness camp at Mashatu in Botswana, to capture those moments when human attention is occupied elsewhere... Go on, have a look and feast your eyes! Lewa (Kenya): There are certainly places in nature where you just know, with every fibre of your being, if you go there, you will never be disappointed… The Lewa Wildlife Conservancy in Kenya is such a place, and once again this wilderness is delivering! Instructor Mark Gunn is currently there, conducting an EcoTraining 28 Day Kenya Safari Guide course, with participants from Switzerland, Germany, America, South Africa and Kenya. Reports of Big Five sightings have been coming through thick and fast. Just take a look at this blow-by-blow account of a morning walk! 07:07: I can see lion, buffalo and elephants from my position. 07:46: Now we have two white rhinos but have lost the lion. We are walking to the ridge to try and spot them. 07:55: We have reached the ridge. Still looking for the lion but we have sight of three herds of elephants. There are a couple of lone bulls. Two groups of rhinos, a herd of buffalo and a solitary bull elephant from earlier. Giraffe herds on three sides and a lot of zebra all around. Also have walked past a group of Grants gazelles. Just found the lion tracks, we are following. 08:32: Right now we have an elephant in front at 40m and two black rhinos to the right at 80m. 08:45: We’re still with the elie but three white rhinos have also walked into view. 08:56: Now we are headed towards a herd of buffalo, more elephants and four white rhinos. 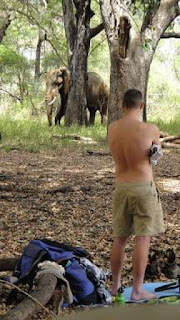 11 February: Two elephant encounters as well as rhino on the first walk. 12 February: Lion, elephant, rhino and buffalo on the same walk. Spent a long time with the male and female lion. 13 February: Encountered elephants and buffalos in the morning. Afternoon walk – black rhino, buffalo, lion and white rhino. 14 Feb: Lion in the morning. Elephants, white and black rhino in the afternoon. The days are warm and the nights are cold. 15 February: There were lions inside the camp fence early this morning. We also saw Elvis the black rhino at very close range on the walk. 16 February: Very good white rhino encounter, seven of them. Then elephants. Very good birding. Grevy zebra close up. For the last two years EcoTraining, a leader in field guide training for 20 years, and Tetra Tech, an American consultancy firm for the Jordan government and NGO in charge of the national parks in Jordan, has been working together to transform the conservation and guiding sectors in Jordan. The result being four promising Jordanians sent to South Africa to complete the one year professional field guide course presented at EcoTraining’s wilderness camps across Southern Africa. And in the last 12 months Abdullah Abu’Ramman, Osama Alsomadi, Osama Alrabay’ah and Nadia Alalul were exposed to the diverse ecological and geological terrains, landscapes, wildlife species and so much more in places like Makuleke, Karongwe, Selati (South Africa) and Mashatu (Botswana). For the first six months, instructors shared and imparted their wealth of knowledge on a variety of subjects – geology, astronomy, ecology, botany, taxonomy, animal behavior and conservation management, to name but a few. Then they got a taste of what life as a field guide really is like with their placement at a lodge. That part of the journey has just ended, culminating in their graduation with honors. And now it is continuing with the foursome, armored with the appropriate knowledge and fully certified under EcoTraining and South Africa’s acclaimed guide qualification system (FGASA), returning to Jordan where they will practice as guides and trainers in their own right, transforming the guiding experience in Jordan and serving as the foundation for the next generation of highly qualified Jordanian nature guides. The next phases of the program will involve additional training in Jordan and setting up a training academy in that country. Apart from being amazed at the amount of knowledge they accumulated in the time since taking those first tentative steps a year ago, Nadia Alalul says she is fully aware of the huge responsibility now resting on their shoulders, to transform and help shape the guiding industry in a different part of the world. Yes, what they are going to try and accomplish, is a serious affair, but Nadia says despite the importance of it all, it was the adventure of a lifetime. Upon graduation, Nadia reminisces and shares some of her fondest memories. “We have had the privilege of living in an environment that few people nowadays get to experience, living among wild animals in their natural environment, and being able to study and observe from only a short distance away. I won’t easily forget working late one night on a raised platform in one of the wilderness camps. I didn’t realize that everyone had gone to their tents. Usually most of the students will be in bed no later than 11pm because of the cold and to avoid any run-ins with wild animals at night. I realized at around 12:30am that there was no one else around and decided it was getting too cold to finish my work. I picked up my headlamp and from the top of this platform looked around and saw three pairs of glowing eyes reflecting light right back at me. There were three spotted hyenas (probably the ones who had ripped my slippers to shreds a few nights earlier!) just below me and I soon realized there was no way I was walking back to my tent alone. All in all this has been an amazing adventure and I had the time of my life! Make no mistake, it has been grueling and the amount of information that I have absorbed has been enormous but I have learnt so much and everything has been interesting. I can recognize hundreds of bird calls, achieved a track-and-sign level 1, can tell the difference between a black and white rhino by looking at their dung, which way a leopard is moving and whether it’s a female or male by looking at its tracks in the dirt, and I know which tree can ease my pain and which one could kill me. For two decades now EcoTraining has been training field guides, starting way back in 1993 with the first batch of eager students attending the inaugural course in the Sabi Sands reserve in Mpumalanga. Since then a great number has gone on to make their mark in the industry and are continuing to do great work all over the world. We want to hear from you, so send us your stories! Go and like our official fan page on Facebook at EcoTraining – Ecotourism specials. Also visit us on www.ecotraining.co.za and if you have any questions or queries, send an email to enquiries@ecotraining.co.za.